When I found out I was invited to Russia with Nutrend I was sooo excited, literally packed my things few weeks before the trip, ha ha. It all started with 3 hours of flight to Moscow and settle down in the very nice Hotel Borodino with gym and wellness, so we were really happy about that. So, my first time in Moscow and I got a bit sick straight away after we landed. Maybe because of time difference OR FREEEZING temperature, he he. But in general, I was sooo excited to be in Russia and for all three days that were in front of us! By the lunch time, we came to SNPRO expo, where Nutrend booth was waiting for us. Booth was nice and in a great position. We had small stage, where we took some pictures with fans. First day was so called business day, so there were not so many people around. But everyone who came by, could try out our protein bars and protein shakes. Everyone loves that, right! Luka was documenting everything taking pics that are also posted on Nutrend Instagram, and video stories (highlight SNpro Moscow). After the expo we went for a dinner near the hotel in traditional Russian style. The waiter was really friendly and we ate great, although Russian people don't speak English so well, we came to the same language at the end. We just spoke Slovenian, Czech, Russian, English and understood each other well. …and the most crowded day. We were at the expo at 10 o'clock, and people were already running into the expo, trying new products, taking pics with fans, and participating at giveaways. 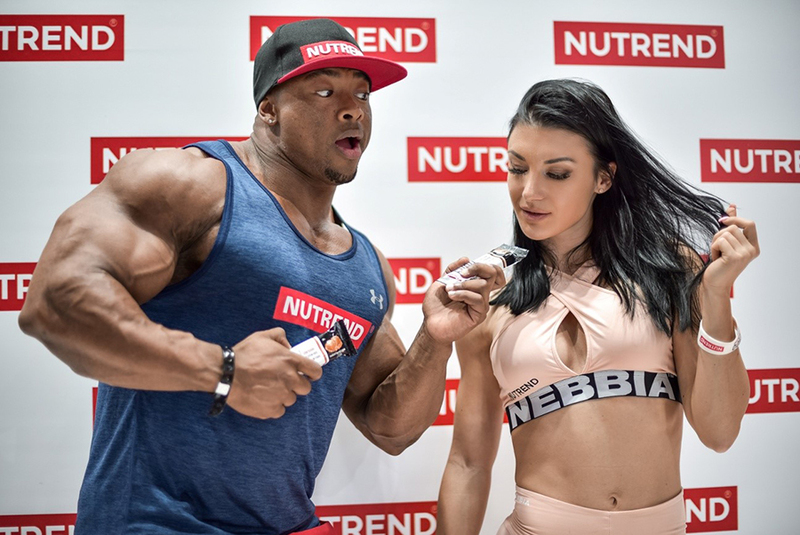 At our booth, we made different shows, from squat challenge, to plank challenge… you didn't need to try finding people to come and participate, because in some countries people are "affraid" to step on stage to win a price. But not here.. we had a great time, and even though my little illness I enjoyed each moment there! It was nice how some people can recognize you that far away from home. They also brought me some presents, which was really nice from them, although they didn't need to do that. So Russians are really nice people! It was crowded day, and Luka was running around like a sprinter. I barely could find him when I needed him. He was making photos again, insta stories, insta videos and more – sometimes I wonder if he could make a promotion for Duracell bateries company, or he just took a bit too much of preworkout hehe. After the expo, it was again time for dinner, because we were really tired after whole day at the expo, so food was something in our first mind straight after we finished with work. We went for a night walk through city center, which looked even nicer, if possible, at night. We took some pics, and insta stories of course hehe, and then we actually almost ran to restaurant because we were freeeeezing and we were sooo hungry. So the food there, where Nutrend Russia took us, was amaaazing. We ate everything within 1 hour. Perfect end of great day! Usually at some expos Sundays are pretty calm, but here in Russia there were still a lot of people visiting the expo. Again, we had price challenges and took some pics and videos with Russians. And then it came time to say goodbye. We were really happy for the opportunity we had to visit Moscow. So we want to say thank you Nutrend and Nutrend Russia for taking care of us there and providing us everything we could wish for! SPASIBA! Hope to see you again! Now, I'm back home, sick, drinking watermelon glutamine, C vitamin and waiting that these "warmer" temperatures here in Slovenia makes me back on my feet again, to go to gym and do a good leg workout!